Remembered or not, dreams occur in everybody’s sleep for roughly two hours each night. From the ones that feel indistinguishable from reality to the dreams that mentally vanish before you even open your eyes, the habit of dreaming is universal. We surveyed over 1,000 people across the country to understand what they dream about and how they interpret their visions. We also made sure to ask about sleeping habits and just how much significance they attribute to a dream. Curious how you fall in with the crowd when it comes to interpreting your nighttime imaginations? Read on to find out. When we asked Americans to list their dreams from the the past year, the most often repeated theme was of a sexual or intimate nature. While such dreams are fairly common, their interpretation varies when it comes to the dynamics of our personal relationships. Also claiming major reverie real estate were some more frightening scenarios. 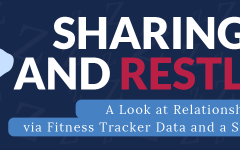 Roughly a quarter to half of all survey participants imagined falling, running without being able to move, or even their teeth falling out, all within the past year. 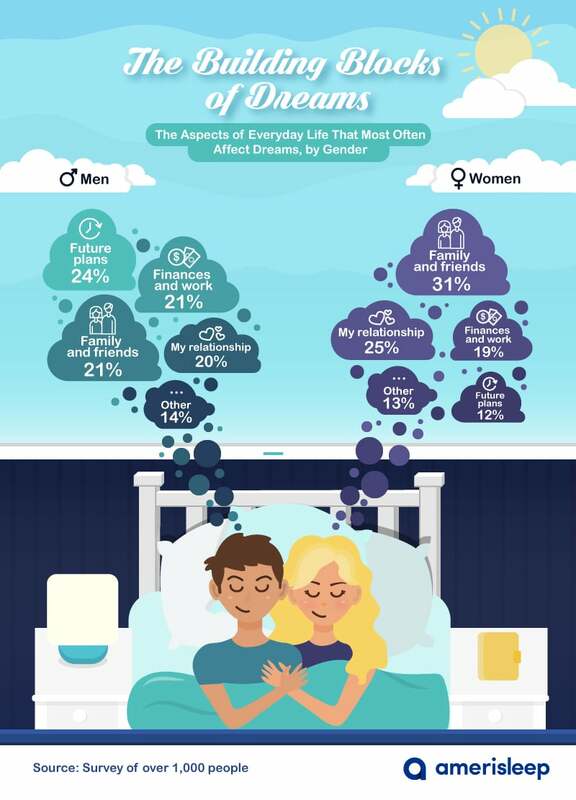 While men and women’s top five dreams were similar, topics began to diverge slightly further down the list. Nearly a third of women had dreamed that their significant other had cheated on them within the past year, though this scenario didn’t top men’s lists. 35 percent of women also endured a nightmare of a relative dying within the past year, whereas men dreamt equally as often about running late – a much more bearable nightmare. Women were 8 percent more likely to dream of their teeth falling out, though the interpretation of this dream is still up for debate. Whether it’s considered a nightmare or an exhilarating rush, breaking the law occurred in the dream worlds of 1 in 5 men, yet this imagery was absent from women’s most common visions. Also sitting on the fence between nightmare and reverie was the vision of cheating on your significant other- this made the list of women’s most common dreams (roughly a quarter of them), though this didn’t make the most common list for men. Dreams generally happen in the REM part of the sleep cycle. 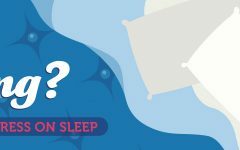 REM (which stands for rapid eye movement) sleep usually begins about 90 minutes after you actually fall asleep, and our bodies cycle in and out of REM sleep throughout the remainder of the night. Fortunately, dreaming doesn’t disturb the quality of these cycles. In fact, dreams tend to represent quality sleep and sleep health, according to experts on the subject. If you needed another reason to get more sleep, know that people who got five or fewer hours of sleep were 20 percent more likely to have nightmares most nights. 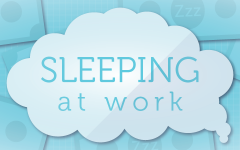 The National Sleep Foundation recommends that adults get between seven and nine hours of sleep each night. 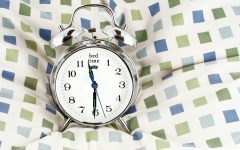 As it turns out, sufficient sleep not only benefits your health during the day, it can give you better dreams at night. Ultimately, the interpretation of your dreams is really an individual decision. Personal thoughts or concerns may continuously seep into your subconscious, where they can then later play out in your sleep-controlled imagination. The survey participants who remembered flying during their dreams most often interpreted them as a sign that they were in a successful place in life. Whether financial, physical, or emotional, the feeling of success appeared to correlate heavily with the notion of flight. While flying was largely interpreted with a positive connotation, most of the people we polled interpreted dreams of falling much more negatively. More than a third of the people who saw themselves falling viewed it as a manifestation of their own anxiety about letting go. Not far behind were the 28 percent who believed this dream indicated a major life problem. According to experts, dreams of cheating (either by you or by your partner) can indicate dissatisfaction in your relationship or a secret suspicion that your significant other may be seeing someone else in the real world. Similarly, most people believed that their dreams of cheating on their significant others meant that they were facing a difficult decision. 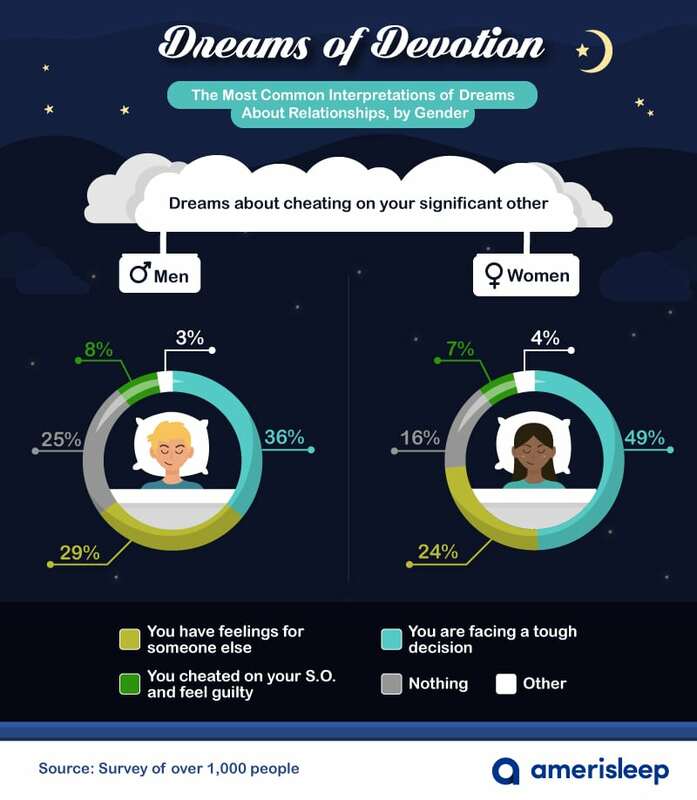 Roughly 1 in 4 women (and slightly more men) said they thought those dreams meant they secretly had feelings for someone else. Either way, dreams of infidelity didn’t exactly invoke visions of paradise our survey takers. In some traditions, dreams of death can be interpreted both positively and negatively. That said, the 1,000 Americans we surveyed shared how they personally decipher their own dreams about death, and positivity didn’t exactly resound. We found that roughly 37 percent of the people who had dreams of their own death thought it showed a fear of death or getting sick. Nearly a quarter of participants took this scenario as a sign that they could use a fresh start. Not everyone we polled attributed as much meaning to their fatal dreams, however. 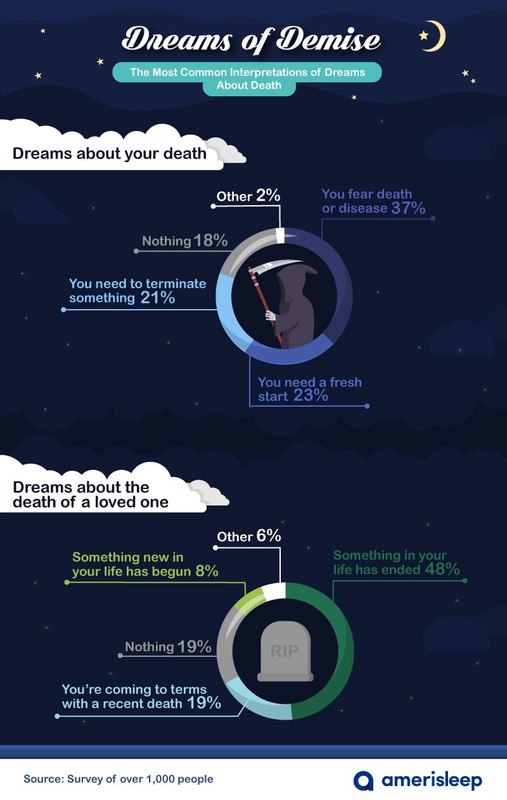 Nearly 20 percent were confident that the death of a loved one or their own in a dream meant absolutely nothing. The most common interpretation of seeing a loved one die, however, was shared by nearly half of participants: they believed this dream to entail anxiety about letting go. While anxiety might not be ideal, it certain beats a more literal interpretation of this dream. According to at least one clinical psychotherapist, dreaming is how our conscious mind and our unconscious mind communicate with one another. With that thread of logic, nobody else can ever truly understand what your dreams may be trying to tell you specifically, and even the most basic dreams could be relaying something personal. Other experts also recommend keeping a log or a journal of your dreams to help you remember them more easily over time. For the most part, Americans claimed they rarely searched for meaning in their dreams beyond the imagery. That said, women were generally more likely than men to try and find dream-based significance. 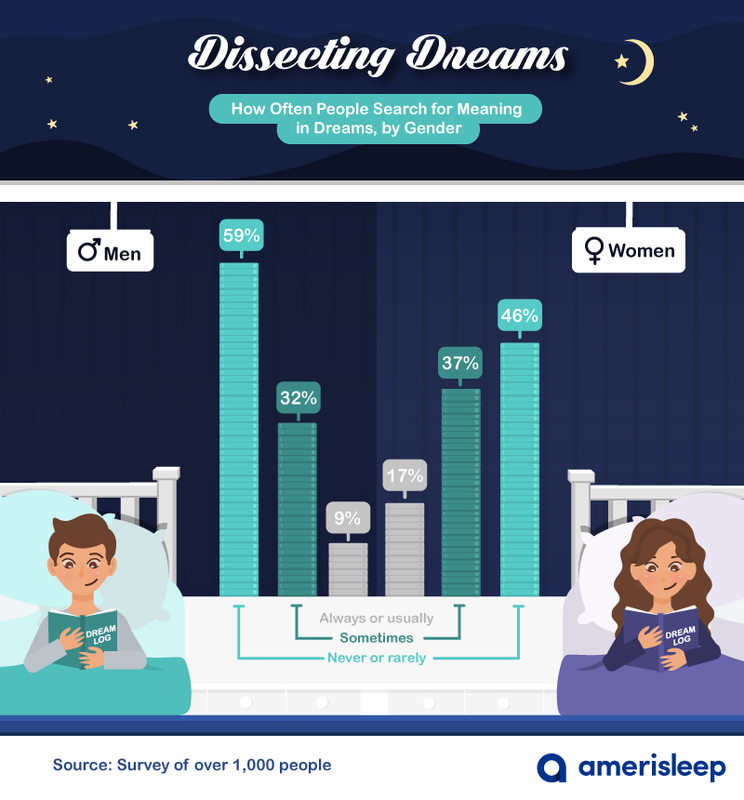 While only 9 percent of men said they always or usually try to find some meaning in their dreams, 16 percent of women said the same. Moreover, just 28 percent of men and 20 percent of women said they never looked for meaning in any of their dreams. So if our dreams are a melding of our conscious and subconscious minds, what pieces of everyday life impact the things we dream about at night? We asked our survey respondents to weigh in. According to nearly a third of women, friends and family were the biggest factors in their mid-sleep visions. Nearly a quarter of men we surveyed said planning the future actually factored into their dreams most heavily, compared to only 12 percent of women. Research has shown that women tend to feel less comfortable planning for their futures, particularly where finances are concerned. One in 5 men and 1 in 4 women also shared that their relationships have the biggest impact on their dreams. Of course, having sweet dreams is ideal. The people we surveyed who weren’t sleeping enough were much more like to have nightmares as compared to people who got closer to the recommended number of hours of sleep each night. Your mattress is certainly a huge factor in determining the quality of sleep you get each night. Having a mattresses designed with the best in sleep technology is the crucial first step to helping you stay comfortable and cool throughout the night. 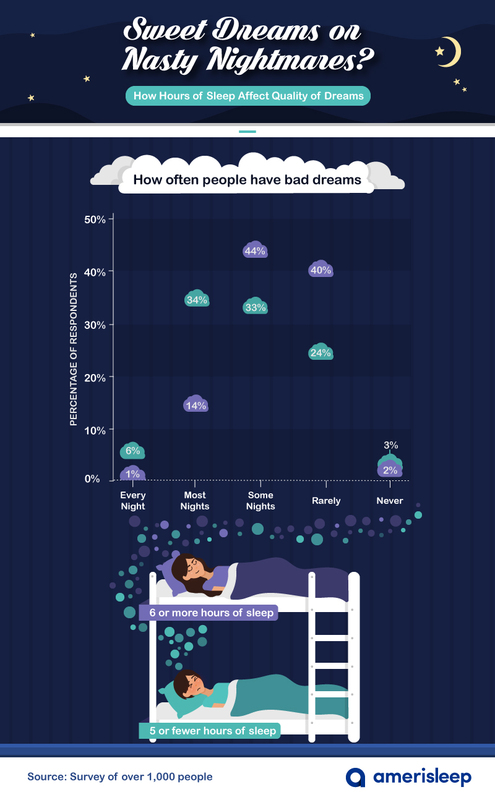 We surveyed over 1,000 people in the United States about their most common dreams from the past year. We gathered information on everything from often they had nightmares to how they internalized the meaning of their most frequent dreams. Both men and women provided us with much needed insights into their dream worlds. Dreaming of sharing what you’ve read here for noncommercial purposes? Great! 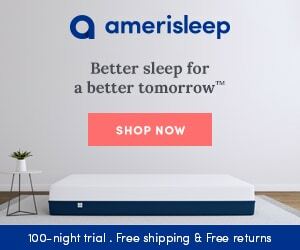 Just make sure to link back to this page and provide proper credit to Amerisleep.